I've long blogged about the intersection of diabetes and technology. From the sad state of diabetes tech in 2012 to its recent promising resurgence, it's clear that we are not waiting. 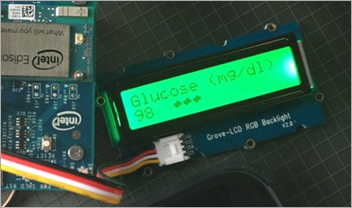 If you're a Type 1 Diabetic using a CGM - a continuous glucose meter - you'll want to set up Nightscout so you can have a REST API for your sugar. The CGM checks my blood sugar every 5 minutes, it hops via BLE over to my phone and then to the cloud. You'll want your sugars stored in cloud storage that YOU control. CGM vendors have their own cloud, but we can easily bridge over to a MongoDB database. The "flat" value at the end is part of an enum that can give me a generalized trend value. Diabetics need to manage our sugars at the least hour by hour and sometimes minute by minute. As such it's super important that we have "glanceable displays." That means anything at all that gives me a sense (a sixth sense, if you will) of how I'm doing. Alexa, what's my blood sugar? However, since the keyboard has a localhost REST API and so does my blood sugar, I busted out this silly little shell script. Add a cron job and my keyboard can turn from orange (low), to green, yellow, red (high) as my sugar changes. That provides a nice ambient notifier of how my sugars are doing. Someone on Twitter said "who looks at their keyboard?" I mean, OK, that's just silly. 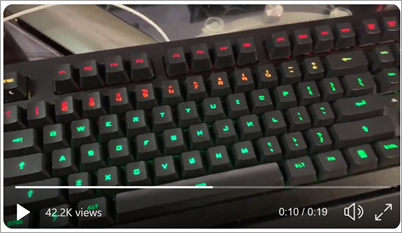 If my entire keyboard turns red I will notice it. Again, ambient. I could certainly add an alert and make a klaxon go off if you'd like. # by sending JSON signals to the Q desktop public API. set -e # quit on first error. # Zone are LED groups. There are less than 166 zones on a 5Q. # This should cover the whole device. echo "Sugar is $bgvalue and color is $COLOR!" #echo "Sending signal to zoneId: $i"
This local keyboard API is meant to send a signal to a single zone or key, so it's hacky of me (and them, really) to make 100+ REST calls to color the whole keyboard. But, it's a localhost call and it's not that spendy. This will go away when I move to their new API. Here's a video of it working. What are some other good ideas for ambient sugar alerts? An LCD strip around the monitor (bias lighting)? A Phillips Hue smart light? Consider also that you could use the glanceable display idea for pulse, anxiety, blood pressure - anything in your body you could hook up to in real- or near-realtime. Sponsor: Get the latest JetBrains Rider with Code Vision, Rename Project refactoring, and the Assembly Explorer. Improved support for C#, VB.NET, F#, TypeScript, and Angular is all included. Medical alert wristband with embedded peltier cooler against the skin. Hot for high, cold for low. Battery life would probably be an issue. I light-up hat would have useful when we were traveling in Europe years ago. :) I’ll never forget the random stranger (the angel) with the oranges. Smart watch notifications are a good alternative for notifications that require immediate attention. I imagine you could customise the face to add blood sugar levels, updated by connecting directly to your 'body REST API'. A gentle vibrate notification could tell you if anything happens that requires attention. Learn about fashion and put on a way which makes women pay attention to you. for me personally. Here are issues to aid you bring back the completely love. I've been using Sugarmate Glance on my Macbook. It displays my current Dexcom G6 reading, an arrow, and the delta from the previous reading. I do like the keyboard lighting ability, it's tempting me to get a Das. But unfortunately I don't think there's a way to get my readings from the G6 via a REST call, I'll have to look into that. Scott, any hope of seeing you update your NightWatch REST API to support XML as well as JSON for both input and output? Hopefully with support for swagger and OpenAPI 3.0 as well. As far as I can tell, it is still a horrible mess, but I was hoping to see how wrong I am and how easy it actually is supposed to be. I have one off-topic question, what is WT.mc_id query string that you append to github links? Before you sign any personal loan, constantly talk to somebody that is aware of lending options and financing. You should check having a legal professional or other people you believe in to allow them to go over each of the documents. It is best to know what you really are signing in order to avoid surprises. If you appreciate to grind your own personal espresso, attempt incorporating several nuts to the grinding machine combined with the legumes. A lot of people benefit from the fascinating flavoring nut products supply to a cup of coffee. Some very nice nuts to use consist of: almonds, hazelnuts and macadamia peanuts. You can even experiment with crazy combos!